This graph is circulating around the internet and evidently started out on the Washington Post. I have several questions about it, but the most important to me is how do they compute these official surplus/deficit numbers? I've been claiming for years that there was no surplus in 2000 and Clinton's insane 10 years projected surplus was based on the assumption not only that the recession of 2000 (weren't we recovering from that by March?) would never happen but that we would continue the dot-com stock boom forever. 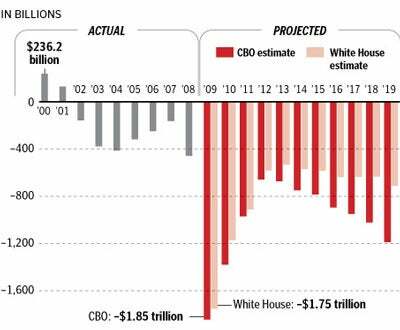 But here's a graph stating (probably from CBO numbers) that there was an actual $236 billion dollar surplus in 2000. In 1999 the public debt was 5.656 trillion, in 2000 it was 5.674 trillion, and in 2001 5.807 trillion. How do you run a $236 billion surplus and end with 20 billion less than you started? I assume it has something to do with off-the-books accounting for Social Security and Medicare (which despite Obama's promise to bring war funding on the books, he for some reason hasn't moved to move those onto the books. Perhaps because then the Democrats would have to quit claiming war spending is the biggest expense of the federal government) but I really would like to know how that happens. Since I've posted this, I'd like to go ahead and address a few other things about these numbers. It is first off not true that Obama inherited the worst economy since the Great Depression. By nearly any reasonable measure the economy was worse at the end of the Carter administration than at the end of the Bush one. I also think it strange that people keep harping on his inheriting a recession. I actually remember early 2001 and the fact that the dot-com recession started under Clinton didn't seem all that interesting to most people then. By late 2001 we were already talking about how the economy was recovering from Bush's recession but it was a jobless recovery. He did inherit an insane deficit, but it's not a very convincing argument that after 8 years of Bush he got a 400 billion dollar deficit (including the first part of TARP 1, I think) from by far the worst year of the Bush administration so he needs to spend on average more than double that every year of his administration. I'm rarely shocked by a lack of logic, but it truly shocks me that people think that President 43 having the worst deficit ever makes it reasonable for President 44 to be twice that bad. I just saw this note on Obama's permanent campaign PAC asking people to call overly conservative Democrats who oppose his "common-sense agenda". I must admit. I had my doubts that Obama could bring a new era of bipartisanship to Washington, but given the impressive list of Democrats he has alienated it looks like he has managed it. Despite almost overwhelming majorities in both the House and Senate he's still worried about getting his programs through a very bipartisan opposition.